What’s up everyone! This is Grant here once again. Right now is an exciting time for the Pokemon community. Brazil Internationals just wrapped up and Roanoke Regionals is right around the corner. Zoroark-GX once again proved how powerful of a card it is. After winning in both Standard and Expanded, players are wondering: “How do you beat Zoro Control?” As the saying goes, “if you can’t beat em, join em.” Today I will be going over a slightly modified Zoroark-GX Control list for you. Additionally, I’ll be taking a look at the interesting Gardevoir-GX deck that the recent World Champion, Robin Schulz, made Top 16 with. In case you didn’t watch much of the event, Team USA showed up to Brazil with an incredibly strong Zoroark Control list, and many players made Day 2 with the deck. In fact, both Caleb Gedemer and Danny Altavilla ended up making Top 8, with Danny taking home the gold. A Brazilian player also made Top 8 with his own take on Zoroark Control, but he was disqualified for cheating after winning his Top 4 match. Zoroark Control is such a strong deck that it was able to take three Top 8 spots as well as the winning title. Whether you like the deck or not, it will definitely be a Standard mainstay for the foreseeable future. In particular, I am looking at Zoro Control and ways to counter it for Roanoke Regionals this coming weekend. Team USA did a good job with their Zoroark-GX list that I don’t have much to change. My current list is only four cards different. Like other Zoroark-GX decks, this one packs a full 4-4 line. Unlike other Zoroark-GX decks, you don’t need to attack with Zoroark-GX all that often. In fact, Riotous Beating is used more for removing Energy via KOs. You don’t necessarily win on Prize cards all the time, though you can choose to do so when your opponent’s resources are depleted. 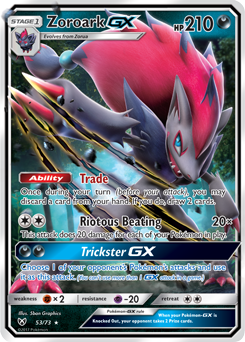 The high Zoroark-GX count is so that you can set up two or three quickly and use multiple Trades per turn. The more Trades you use, the more cards you can access. The more cards you can access, the more you can disrupt your opponent and run them out of Energy. That is the strategy of the deck. I was surprised to learn that the original list only ran three Double Colorless, but it makes sense. Oranguru is the main attacker and it can use any Energy; Zoroark-GX is the one who relies on Double Colorless. The purpose of Magcargo is that it sets up perfect Trades so you can get whatever card you want. This improves consistency and allows you to find specific disruption cards at specific times. I am confused as to why the deck originally ran Alolan Muk. In theory, it is used to auto-win Granbull, but the deck auto-wins Granbull even without having Alolan Muk. I strongly recommend cutting this card. There is no use for it. You might think that Alolan Muk means you can cut Ditto Prism Star, but you’d be wrong there. Think of this card as a Slugma that can be searched out with a turn one Professor Elm’s Lecture. Of course, it can evolve into Zoroark-GX too, but I use it to turn into Magcargo. You need consistency in the form of Tapu Lele-GX. You want a turn one Professor Elm’s Lecture, and you usually want a turn two Cynthia. Of course, Tapu Lele-GX will sometimes be used mid-game to find various tech Supporters. You can remove it from play via Rainbow Energy and Acerola. It isn’t much of a liability and this deck sometimes has consistency issues. You could go down to two Tapu Lele-GX and still win Brazil, but I prefer three. Articuno-GX is used for its GX attack. It’s useful for when an opponent loads a lot of Energy onto something while you are still trying to set up. Examples would be Blacephalon-GX using Kiawe and Gardevoir-GX. You might use this against Buzzwole or Lycanroc-GX as well. 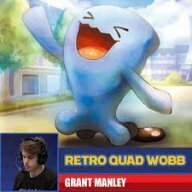 Grant Manley is a competitive Pokemon TCG player from North Carolina. He loves playing on a competitive level with unusual decks. When Grant's not playing Pokemon, he's probably playing soccer. He is a homeschooled Senior in high school. He also enjoys Smash Bros and other various strategy games such as chess .